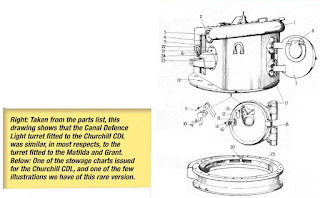 The Grant CDL (Canal Defence Light) was a special vehicle mounting a turret in which was located a powerful searchlight that was supposed to dazzle an enemy during night operations or illuminate targets at night. The device known under the cover name Canal Defence Light was one weapons of World War II that was destined hardly ever to be used. In essence it was a simple idea, in which the normal gun turret of a tank was replaced with another housing an intense light to illuminate battlefields at night. All manner of tactical ploys were advocated for its use, ranging from simply blinding an enemy to providing general target illumination. The idea of mounting powerful searchlights on tanks was first mooted during the mid-1930s by a group of interested civilians who ’sold’ the idea to the War Office in 1937. The War Office carried out a series of development trials under conditions of great secrecy, and by late 1939 a turret was ready for production. The secrecy continued with the project being known as the Canal Defence Light, or CDL. The first turrets produced were for the Matilda II infantry tank, and all that the fitting of a CDL involved was the removal of the normal turret and its replacement by a new one, though changes had to be made to the Matilda’s electrical systems as well, In the turret the searchlight was positioned behind a vertical slit in which was a shutter. In use the searchlight was switched on and the shutter was opened and closed very rapidly to provide a flickering impression to an observer in front. This flickering made the range of the CDL light difficult to determine, and anyway the light was so powerful that it was difficult to look into the beam even at quite long ranges. Some 300 CDL turrets were ordered to convert Matildas to the CDL role, and one brigade of Matilda CDL vehicles was based in the UK and another in North Africa. The military planners were determined to use the impact of the CDL units to the full and constantly awaited the chance to use them to maximum effect. That chance somehow never came and the North African campaign was over before the CDLs could prove their worth. However the Normandy landings lay ahead, and it was planned to use the CDLs there. But at the same time it was felt that the CDL turrets should be placed on something rather more up-to-date than the slow and stately Matildas, so Grant tanks became the chosen carriers. Thus the CDL was carried throughout the war but sparingly used. However, the idea certainly attracted attention. 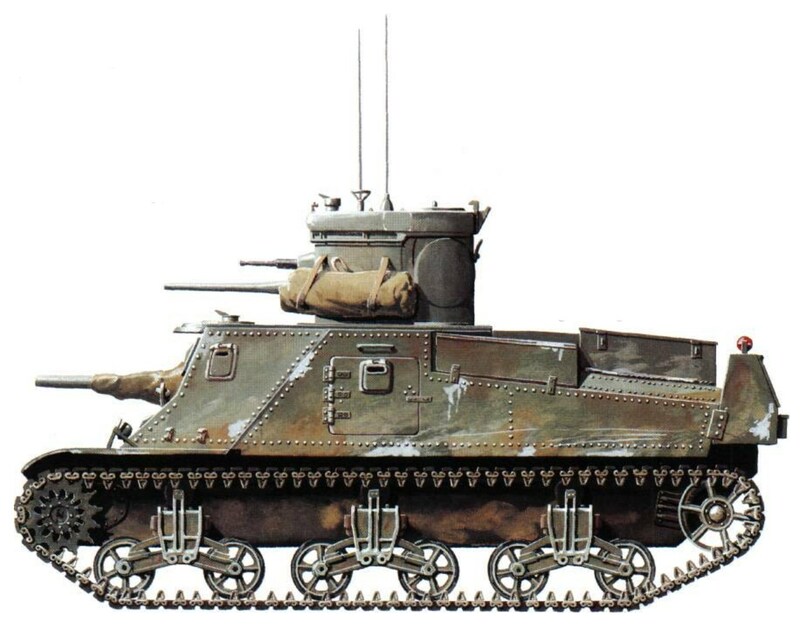 The US Army was most impressed by what it saw of the CDL at various demonstrations and decided to adopt the CDL for itself, and thus produced 355 CDL turrets for mounting on otherwise obsolete M3 Lee tanks. These were used to equip six tank battalions for special operations in Europe. The cover name T10 Shop Tractor was used for US CDL vehicles. The U.S. Army already had two battalions equipped with the CDL in June 1944 but never considered using them on D-Day. Instead the CDLs were used for the relatively unexciting task of providing ‘artificial moonlight’ to illuminate the crossings of the Rhine and Elbe in early 1945. The US 738th Tank Battalion (spec) manned the CDL (Canal Defence Light). 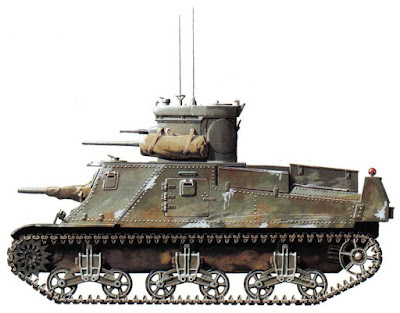 This was an M3 Lee/Grant chassis, mounting a modified turret containing a 13,000,000 candle power arc lamp reflected through a mechanical shutter. This weapon induced blindness and disorientation, and the flickering prevented the enemy from identifying its source and location. The first use of the CDL was against German frogmen, who were attempting to destroy the Ludendorff Bridge at Remagen. The device worked as intended, and the frogmen were quickly rounded up. 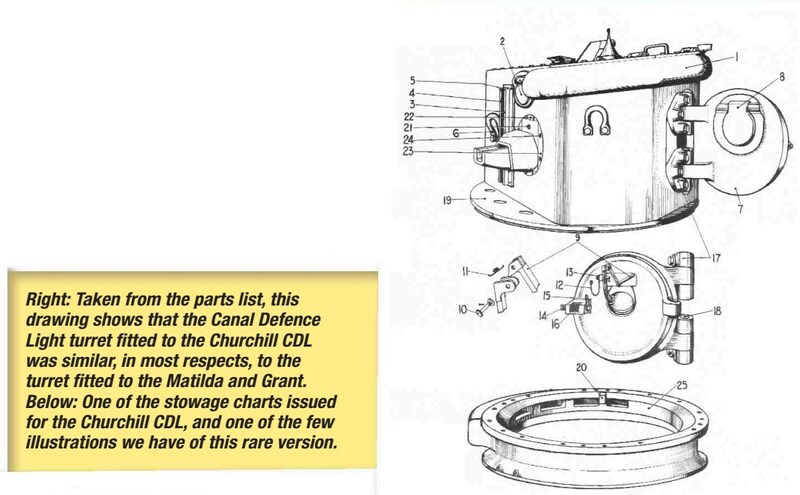 The Churchill Canal Defence Light is much more difficult to write about since nobody, as far as we know, has yet seen a photograph of one. 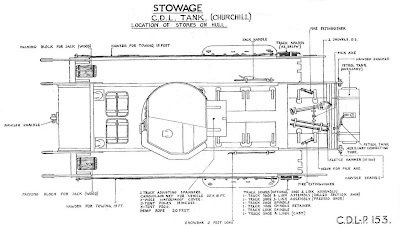 There is a stowage diagram in the Tank Museum archive plus an illustrated parts list and a sketch of one in the book Sutherland's War but none are really good enough to work up a description from. However, these illustrations seem to indicate that the tanks were fitted with the earlier pattern air intake which suggests they were made quite early on. We know that the turret ring diameter of the Churchill was only 52in (1321mm) as against 54in (1372mm) of the Matilda and Grant, so the turrets weren't directly interchangeable. And we also know that the thickness of frontal armour on the Churchill CDL turret was 85mm as against 65mm on the others. On the other hand the Churchill CDL turret was of very similar layout, even down to the Besa machine gun despite the fact that on the Churchill there would have been another Besa in the hull front. But there is no evidence, from the parts list illustration at any rate, of a dummy main gun being fitted. 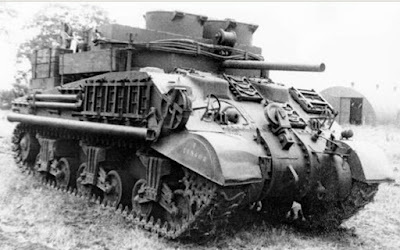 The evidence suggests that there was only ever one regiment equipped with Churchill CDL tanks, and that, we think, was 152 Regiment Royal Armoured Corps (which had been converted from 11th Battalion, The King's Regiment from Liverpool) in the 35th Army Tank Brigade, which became an element of the 79th Armoured Division. If it was configured along the same lines as other CDL regiments that would mean 54 CDL tanks split evenly between three squadrons along with 13 gun tanks and the usual reconnaissance, intercommunication and admin troops and their vehicles. According to a book on the Churchill tank, published back in 1971 by Chris Ellis and the late Peter Chamberlain, only prototypes were built and hulls earmarked for the remainder were later completed as armoured recovery vehicles. 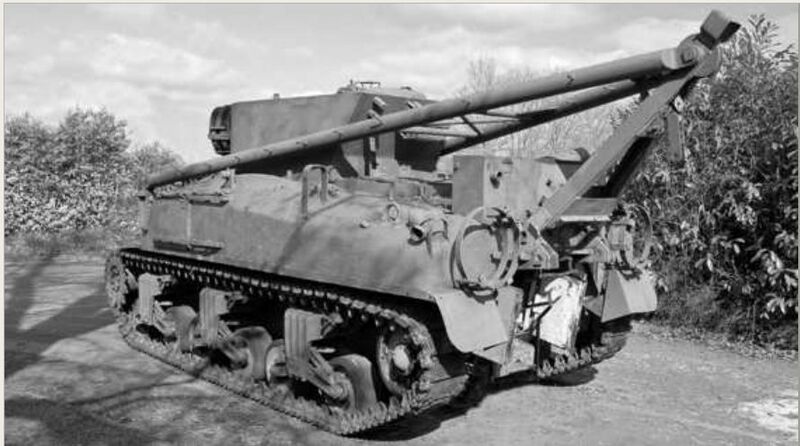 They also suggest that the reason for the abandonment of the Churchill CDL was on account of its slow speed, but in that respect it was the same as the Matilda, which was also adapted to the CDL role but a lot less well armoured. In any case the CDL was normally used in a static role at night, when speed wouldn't matter. 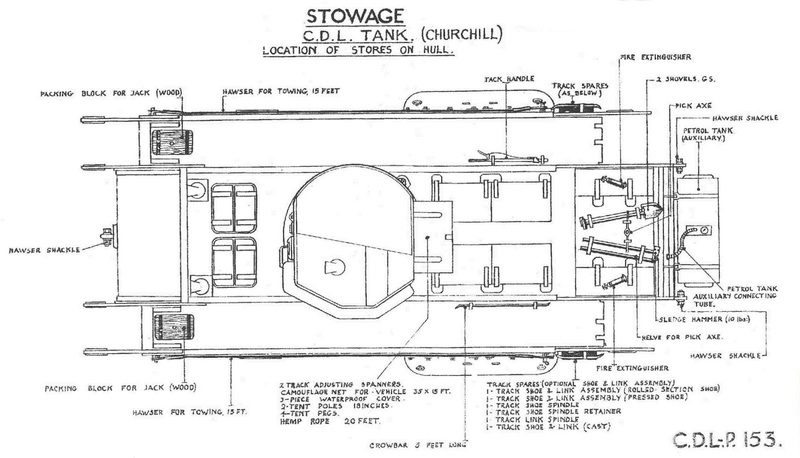 Another peculiarity of the Churchill CDL was that it required a separate engine to drive the electrical generator, a Meadows four-cylinder unit. It was not driven off the main engine as on other types. The engine and generator were located within the Churchill's fighting compartment, probably just behind the hull gunner's seat, with the exhaust funnelled through the hull roof and the air intake for the radiator incorporated in the hull gunner's hatch in the hull front. Quite how he got out in the event of an emergency is not clear. A point has been raised, and quite legitimately, over the potential effectiveness of the CDL tank in anything but flat, level country. Wherever there are hills and irregular ground, and that must be pretty well everywhere, there will always be a problem finding a flat area for the tank to stand and project its beam. Even if that hurdle is overcome, the CDL's effectiveness is limited if there are hills in the way to obstruct the light beam or deep declivities in the ground which it will miss altogether. Indeed, this may explain the reluctance to employ it in action. It can be argued that the best tank is the one that destroys the enemy. Or, depending on your point of view, it's the one that isn't shooting at you. But otherwise, choosing the top tank is always a nightmare of technical and historical analysis. On 19 August 1942, Allied armies put their plan for an invasion of Occupied Europe to the ultimate test - by landing troops on the beaches and trying to capture a French port. France had, by this time, been under German control for more than two years. Book Review: Weapons of the Tankers: American Armor in World War II Zenith Press, 2006, Hardback. On VE (Victory Europe) Day in Germany the United States Army fielded 91 tank battalions grouped in 16 armored divisions and 49 separate tank battalions attached to infantry divisions. The heavy tank never found a satisfactory role in the American military. A number of factors such as logistics, economics and evolving military doctrine eventually eliminated it from the formal inventory of the US armed forces in peacetime, but its role in wartime has never diminished. Sherman Firefly June 1944, France. German Anti-tank crews were trained to fire and focus their fire first on Armored command vehicles and the larger calibre Firefly to knock them out early. 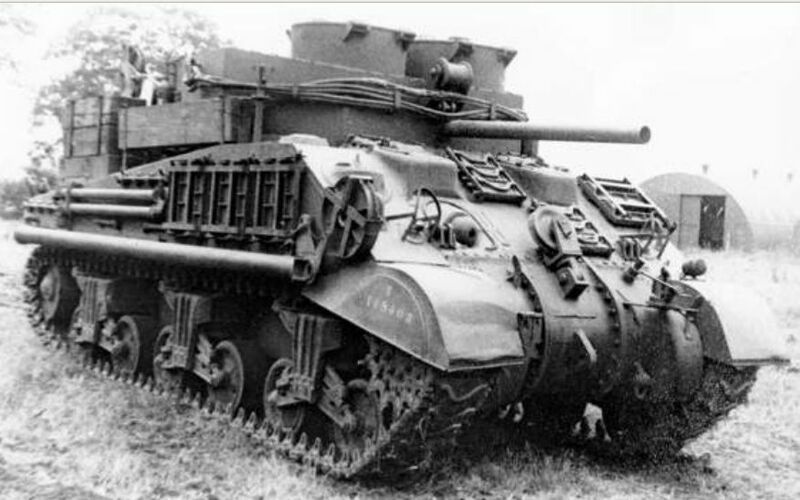 For a variety of reasons tank design in the UK and, to a lesser extent in the USA, had one distinguishing feature. The tanks were always two years out of date. When the German armour had the equivalent of 4- or 6-pounder guns, the British tanks had 2-pounders. When the British upgraded to 6-pounders, the German tanks had the incredible 88 mm. When the three British armoured divisions and eight armoured brigades landed in Normandy their Churchills, Cromwells and Shermans were hopelessly outgunned. Half the German tanks in Normandy were the Panzer Mark IV ‘special’. 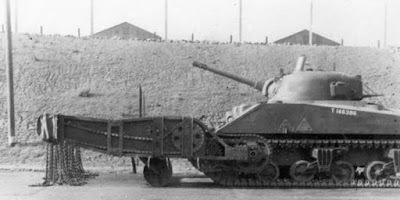 It weighed 25 tons, moved at up to 25 mph, and its 75-mm Kwk 40 gun could penetrate 84 mm of armour at 1,000 yards. Its own front armour was 80 mm. The Panzer Mark V or Panther accounted for nearly 40 per cent of German tanks in Normandy; that is, one of every two tank regiments in most German armoured divisions was equipped with Panthers. It weighed 45 tons, could move at 35 mph, and its 75-mm Kwk 42 guns with a 14-pound shell could penetrate 118 mm of armour at 1,000 yards. Its own front armour was 100 mm. The Panzer Mark VI, or Tiger, was very nearly impossible to knock out. It weighed 54 tons with a maximum speed of 23 mph and carried 100 mm of frontal armour. Its 20-pounder shell from a 88-mm Kwk 36 gun could penetrate 102 mm at 1,000 yards. Many German tank units had one Panther per troop of Mark IVs, a situation similar to the British units, which had one Sherman Firefly per troop. 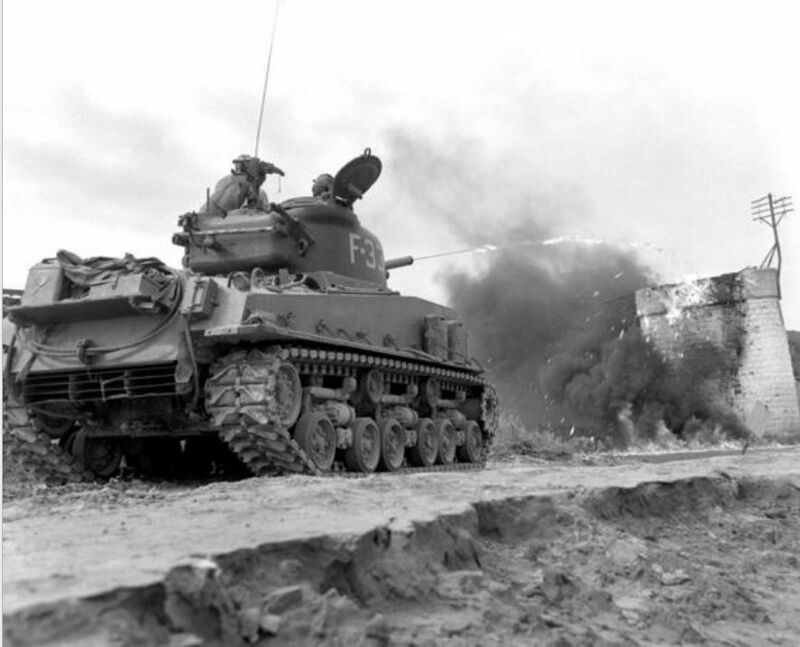 The Allied Sherman tank weighed 32 tons and could travel at 25 mph, but its front armour was only 76 mm thick. It could be knocked out by any German tank at 1,000 yards, even at 2,000 yards, and so was known as the ‘Tommy-cooker’. Its 75-mm gun could at best penetrate 74 mm at 100 yards, 68 mm at 500 yards, and 60 mm at 1,000 yards. However, its Ford engine was reliable and easy to maintain. I could be called upon to take any other crew member’s place and I was the disposable member of the crew. I was sent on foot reconnaissance to find the safest place to locate the tank without placing it in jeopardy when advancing slowly towards a vantage point in a hedge or out of a wood, or at a crossroads in a village, or to attach a tow rope to help extract a disabled tank in the thick of battle. I developed not only a sixth sense but a super sense, a soldier’s deepest sense, the sense to survive. The reality of this equation was very disturbing. Unless a 76-mm Sherman could get very close to the opposition or by chance catch it sideways on (Tiger had 80 mm of side armour, Panther 45 mm and Mark IV 30 mm) the contest was inevitably one-sided. Only the 17-pounder Sherman Fireflies were capable of a level fight. A limited number of Challengers – 200 in all – were allocated to Guards Armoured Division and 15/19th Hussars in 11th Armoured. A 17-pounder anti-tank gun was mounted on a Cromwell chassis and allocated on the basis of one per troop, with a crew of five. However, the German dual-purpose 88-mm gun (ground and AA) was reckoned to be the best available during the Second World War. Its muzzle power could destroy any Allied tank at 2,000 m and its airburst fuse could put a shell on top of a crossroads eight times out of ten. Bill Close, squadron commander with 3 RTR throughout the campaign, was wounded three times and awarded two MCs. As author of Panzer Bait, and having had no fewer than eleven tanks knocked out from under him, his views on tanks have much authority! Our ordinary 75-mm gun could not knock out either a Tiger or a Panther except at about 500 yards range, and in the rear, and with a bit of luck in the flank! The 17-pounder Firefly was our best tank but even it could not penetrate the Tiger head-on at over 1,000 yards. Whereas all our tanks would be knocked out at 2,500 yards by the German 88-mm gun. The great snag was that the Sherman, mechanically reliable and available in great numbers, was inferior in many ways to the German tanks. The armour was thin, the ammunition was stowed in open bins so that it exploded if there was any penetration. A hit almost inevitably meant a brew-up. Some boffin hit on the idea of welding bits of extra armour to protect the bins but their effect was to provide an aiming mark. I certainly saw many brewed-up Shermans with a neat hole in the ‘extra armour’. Even if you fixed spare track plates to the front of the Shermans, the basic weakness remained. You were in a ‘Ronson’ and if you were hit it was best to bale out p.d.q. The regiment had been training since 1939 as an armoured regiment in both an anti-tank and reconnaissance role. It was a pity that their equipment was inadequate. 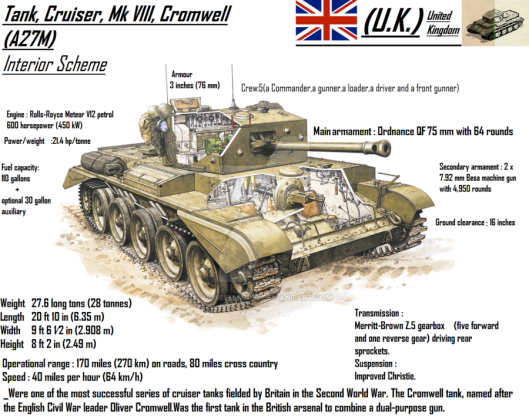 The Cromwell was designated a cruiser tank, fast across country but under-armoured and under-armed. The 75-mm gun was only capable of knocking out German Mark IV and Panther tanks at point blank range while their 75 mm and 88 mm (converted AA guns) could knock out a Cromwell at extreme range. We only started to get 17-pounder guns in the Challenger version of Cromwells in August – too late for 2nd Northants Yeomanry to try out in action. My appreciation of tank v. tank situations was coloured by three oversized factors favouring the enemy, viz silence, muzzle velocity and thick sloped armour. We had to match this with the speed, manoeuvrability and camouflaged outline of our Cromwells. ‘David and Goliath’ I told my dispirited crew to cheer them up. Our 75 mm became known as ‘the sling’ thereafter. I found that if in doubt to stand back and put a couple of ‘smoke’ shells into the area. If it was a possible anti-tank gun or infantry ambush that would often resolve the situation and cause an enemy withdrawal. 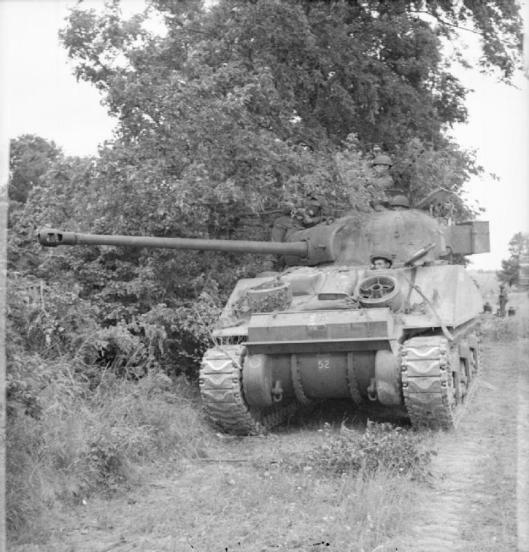 Tank maintenance itself gave few headaches because the Cromwell – Rolls Royce engine, transmission, tracks and traverse – was such a reliable vehicle. The 28-ton tank was reliable on the road, but its 75-mm gun shots bounced off Tiger full frontals. On dry hard fields Cromwell IVs and VIIs would do over 30 mph in fifth gear. But the story gets worse. Every infantry battalion feared the noisy Nebelwerfer mortar, an ugly multi-barrelled brute on wheels, and easily towed. Its ‘moaning minnie’ stonks are said to have accounted for 75 per cent of infantry casualties in Normandy. They came in three sizes with a maximum range of 8,600 yards, and most of the five Nebelwerfer regiments (each of sixty projector-mortars) were concentrated on the British/Canadian front. Only the British 25-pounder field guns with a range of up to 13,400 yards, and 4.5-in./5.5-in. medium guns meshed together in troop, battery and regimental and the larger ‘Uncle’ and ‘Victor’ targets were capable of inflicting dramatic large-scale protective barrages or defensive fire plans. Their pinpoint DF and DFSOS targets were praised by the infantry. The Germans laid hundreds of thousands of mines, mainly Teller mines, in roads or on verges. These could be gingerly excavated after location or lassooed with a long rope and towed away. Booby traps in houses were rarely defused by the REs, but simply blown up on the spot. But one of the greatest perils to infantrymen was schu-mines or S–mines planted randomly in fields and verges. The former were explosives contained in a wooden box more or less undetectable by the usual mine detectors. They exploded with the pressure of a foot on the buried lid. The latter were just as lethal – small anti-personnel mines activated by a trip wire, which exploded at waist height. The schu-mines would take your legs off and the S–mines would tear your whole body apart. I have had to stamp very heavily on reports that began to be circulated about the inadequate quality of our tanks, equipment, etc. as compared with the Germans…. In cases where adverse comment is made on British equipment such reports are likely to cause a lowering of morale and a lack of confidence among the troops. It will generally be found that when the equipment at our disposal is used properly and the tactics are good, we have no difficulty in defeating the Germans. Absolute rubbish of course, unless a ratio of five to one in tank losses was considered acceptable. Simon Frazer’s 15/19th Hussar troop peppered a Mark V tank west of Argentan and hit it twenty-two times. They found the Mark V the next morning. It had been abandoned by its very gallant crew because it had run out of petrol. Admittedly its turret superficially resembled a cheese grater, but not one hit had penetrated. But at least the Allies had almost total superiority in the air. Although at one time or another most units were bombed by the Luftwaffe and the RAF, and almost inevitably were shot up by USAAF prowling Thunderbolts, the universal view was ‘Thank God for the Tiffies.’ 155 Typhoon pilots were lost over the Normandy battlefields engaging in a very close support against Boche strongpoints, tanks, or dug-in 88-mm anti-tank guns, but many individual ‘little’ battles were won and precious lives saved by the RAF intervention. LIMEJUICE was the magic radio call that produced – often from a cab-rank of circling predatory Typhoons – almost miraculous support. The FOOs who were given the opportunity of calling for LIMEJUICE via the regimental radio network, had a feeling of power, of waving a magic wand. There is no doubt that the RAF was very highly regarded by the front line troops despite the occasional ‘incidents’.